Samsung G906S popped up on GFXBench's device list just yesterday with a QHD display. Its benchmark score wasn't that impressive and there was no further information on the device. Well, a few hours later, GFXBench now also filled in the info tab of the mysterious G906S giving us more info on its specs. The page reveals that the smartphone packs a 5.2" QHD display and runs on Snapdragon 805 chipset with a quad-core 2.5GHz Krait 450, Adreno 420 and 3GB of RAM. Other notable features are 32GB internal storage, 16MP rear and 2MP front cameras, and Android 4.4.2 KitKat. Samsung Galaxy S5 model number is G900, which makes us believe the leaked G906S will be an upcoming member of the Galaxy S5 lineup. The rumors about a premium version of the Galaxy S5 started long before the official announcement and continued a few weeks after. Three weeks ago Samsung's CEO J.K. Shin denied the existence of such device though, so it might turn an entirely different device, but we'll have to wait and see. 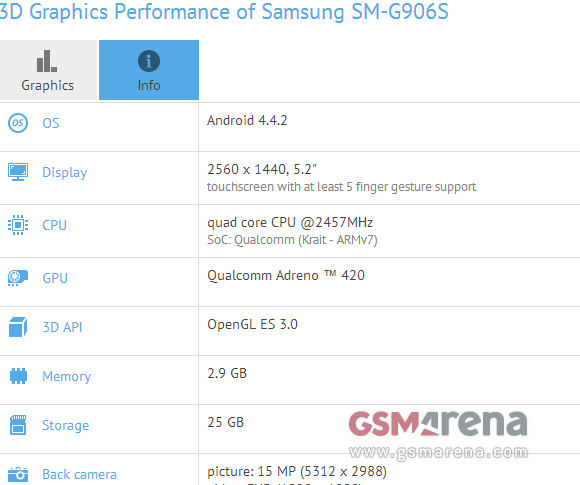 Whatever turns out, apparently a mightier than Galaxy S5 flagship device is already in the pipeline. It seems the Galaxy S4 mid-cycle chipset upgrade from last year might happen yet again. YOU MEAN GREAT COMPLAINTS!!!!! a lot of people who recently buy the S5 is now switching to htc or sony. from the beginning was to be so the Galax S5! It was this that I was waiting from Samsung!!!!! But at least if they will produce this as an upgrade! They will deserve a great compliments (finally) and than I will buy it! !! !